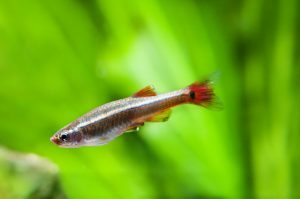 The white cloud minnow (Tanichthys alonubes), also known as the poor man’s neon tetra, is a hardy and attractive cold-water fish. They are often mistakenly sold as a tropical fish, but are much healthier and have brighter coloring when kept in cooler temperatures. White cloud minnows tend to remain small, and grow up to a maximum of 1.5 inches (4cm). They can be identified by a silver body with by their bright red fin, with the males having somewhat brighter colors and being slimmer than the females. White cloud minnows are an incredibly hardy fish, and can be easily housed in a well filtered 10 gallon aquarium. As a general rule, they are peaceful fish, and can be housed with any other small, peaceful fish in a community tank. They should always be kept in groups of at least 5, as they are a schooling fish, and will become stressed if kept in smaller numbers. In the wild, white cloud minnows are omnivores, and eat both small crustaceans and plant material. This diet should be replicated as closely as possible in the home aquarium, and they can be fed a high quality flake food, spirulina pellets and vegetables. In my experience, one of the best prepared foods is Hikari Micro Pellets . When choosing vegetables, their favorites are shelled peas and small sections of blanched zucchini medallions. Any uneaten vegetables should be removed after 24 hours to prevent the water from becoming fouled. White cloud minnows are one of the easier fish to breed, simply due to the fact they rarely cannibalize their young. While most eggs and fry will normally be eaten or picked off by their hungry, uncaring parents, white cloud minnows will ignore the eggs and generally co-exist with the tiniest fry. They do need to be provided with plants to spawn in, and the best plant for to protect the eggs is Java moss. Males will begin to court the females who are generally plumper than the males, by displaying their fins. Once the males have moved alongside the female, the female will then scatter her eggs across the plants in the aquarium. The eggs will then hatch in two to three days and the fry will stay hidden along the edge of the plants. They can be fed infusoria during this stage, and after they are free swimming in the tank, they can be fed baby brine shrimp or commercially available fry food. 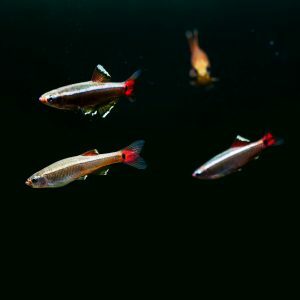 The reason that many people refer to the white cloud minnow as the poor man’s neon tetra, is that back during the 30’s and 40’s, neon tetras were prohibitively expensive to own for most people. So those that couldn’t afford neon tetras, starting buying white cloud minnows which were much more affordable during that time. But don’t let the name fool you – these fish are an excellent addition to any cold water aquarium, and their colors rival the neon tetra. They also have the added benefit of being far hardier than neon tetras, and it is very rare to have problems with these fish. The main reason that these beauties were called the poor man’s neon tetra is because when very young, they have a bright blue stripe similar to that of the neon, though they eventually grow out of it. Great information otherwise my friend! That’s interesting. I’ve read that quote in numerous books – even from many years ago. Do you mind if ask where you heard that? I’d love to correct the information if it’s wrong. Thanks for the response! Just to clear things up here my kind sir, I’m not saying that your information is wrong, I’m just saying that there is a little bit more to it than what was mentioned, so please take no offense from this. It starts at around 3:12 in the video. If the link does not work, you may simply search “Rachel Oleary White Cloud Mountain Minnows” or just copy and paste the link into google. Thank you again! I wasn’t offended at all. I just want to make sure my information is as accurate as possible. I’ll definitely take a loot at the video.